My niece Rowan turned seven on Friday, and as tradition dictates, my kids and I called from Cincinnati to wish her a happy birthday. Knowing full well that her mother (my sister Maureen) had ordered Rowan a custom, gorgeous cake (because she does it on every birthday for each member of her family), I thought I would ask Rowan about the cake first. "So Ro, how was your cake this year?" Without skipping a beat: "It's not the one I wanted," Rowan replied in her usual breathy voice, tinged with a New York accent. There was not a hint of snark in her tone. She was just offering the straight-up truth. A second later I heard her mother shout at her in the background, "Rowan Margaret! We got you a Cinderella cake with a slipper on it!" Oh, snap. Mom pulled out the middle name. I winced and then laughed. I (and Ms. Rowan Margaret) knew full well she'd be getting a talking to after she hung up the phone. But I was intrigued, so instead of dropping the subject I pushed further and egged her on. "Oh, that's just terrible! How awful, Rowan! And on your birthday!" She agreed, "I know, Auntie Mary!" "Well, what kind of cake did you want?" "I wanted a three-tier cake--giant--with a Cinderella on top!" 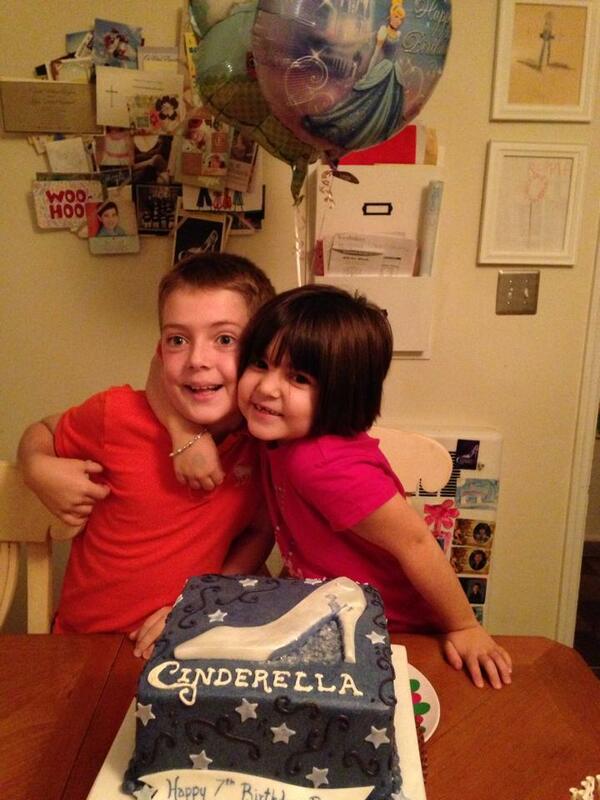 "But, Rowan, your mom said you have a Cinderella cake! With a glass slipper on it!" I said. "But that's not what I wanted!" she insisted. Clearly, she had a vision. A very clear idea of what she wanted. At that, now exasperated, her mother shouted again in the background, "Rowan, you don't even eat cake!" "I like frosting! And I wanted three layers," she said back to her mother. I couldn't help but laugh. There you have it, I thought. Out of the mouths of babes. I can see it from both sides. From my sister's perspective: She had gone above and beyond. She knew how much her daughter loves Cinderella and she was determined to make things fair. Her older son gets a custom cake every year, so Rowan, despite the fact that she does not eat cake, should too. I'd venture to argue there is no one on earth who knows my niece better than my sister. She knows exactly what she wants--all the time. She tried her best to relay Rowan's desires to her baker. Needless to say, Rowan's expectations were not met. In her 7-year-old mind, she envisioned 3-tiers (not layers) akin to a wedding cake. She envisioned an actual Cinderella with a glass slipper on the top. Her expectations did not meet reality and so there you have it: "It's not what I wanted." In a two-minute conversation, Rowan helped me see something clearly. Something I have been struggling with my entire life--as both an individual and a writer. She made me realize that no matter what I do, how hard I try, or how much heart, soul, and love I give I may always come up short in someone else's eyes. I may not match the vision they had or the expectations they had. Because, in the end, I might not be what someone else wanted. Yes, we're all like my sister Maureen, going above and beyond every day--whether it's for the people we love or the people we work for, or as writers, for the people we write for. But, no matter what we give, we can't be in control of what others want or expect. It's impossible to predict. The world is full of Rowans (probably not nearly as delightful, fun, spirited, or outspoken) but full of Rowans nonetheless. We can't possibly try to please them all. And that's not our job. Our job is to do the best we can and to do it with great love. For example, last week was a doozy. If you follow me on Facebook or Twitter, you saw me go crazy in excitement as my book moved up the Amazon rankings. When I woke up on Tuesday, my book Proof of Heaven was 1.7 million in books on Kindle. By the time I went to bed on Wednesday nightProof of Heaven was #1 in three different categories and I was named one of Amazon's Top 100 Authors. But, the week before that? I was as low as low could be. I had read a review of my upcoming novel Proof of Angels from an esteemed literary journal. Now I wasn't expecting a starred review--or even a pleasant one. They are a tough lot, those literary reviewers. And they can get away with it, because they publish their reviews anonymously. So reviewers can rip someone to shreds if they so desire, and never have to sign their names or reveal their credentials (or lack there of). Needless to say, the reviewer didn't attack my story or characters, but the idea of angels. For some reason the author had an expectation that a book called PROOF OF ANGELS would NOT be in favor of angels. Or discuss angels. The reviewer had a real problem with the main character's acceptance in the belief of angels. I had to laugh. Would the reviewer have a problem with Harry Potter's belief in wizardry? In Peter Pan's belief in Pixie Dust? In Dorothy's belief in Oz? In George Bailey's belief in Clarence (since we're talking about angels)? It's this crazy thing called the willing suspension of disbelief. Or in some literary circles: fiction. In my book the main character struggles with faith, belief, and wants desperately to prove that his life has meaning and that he was saved for a reason--and in fact--by an angel. Clearly, the reviewer had different expectations. He or she had hoped that main character would disregard all proof of angels and would prove to be cynical and jaded. The reviewer did not want to read a book that leaned toward hope, the miraculous, or the inexplicable, let alone magic of any kind. Most of all, the reviewer didn't want a book with angels in it. Unfortunately, the book he/she was reviewing was a book called PROOF OF ANGELS. I didn't give the reviewer what she wanted or expected. So, like Rowan, the reviewer said, more or less: "It's not what I wanted." Okay then. It's not want YOU wanted. But, maybe, just maybe it will do for someone else. I was pretty hard on myself and took it pretty badly at first, and then I eased up and laughed. It was the best kind of bad review I ever received, because it said more about the reviewer than it did about me. And, yet doesn't all criticism do just that? Whenever I hear a snarky remark or a negative comment about a book or a person, I think, "Man, that says a lot about X." What we like and what we don't like and what we expect or don't expect reveals volumes about ourselves. I could live my life trying to be #1 every day on every chart, or try being a starred reviewed author, all the while trying desperately to get everyone to like me and what I have to write, and it would be absolutely futile. Pointless. Stupid even. Because, in the end, there are too many Rowans. Too many expectations. Too many impossible standards. To many preconceived ideas. I have to keep at it. I have to do the best I can. And when all else fails: Eat cake.